A passion for ice cream and a passion for vintage campers all wrapped up in one, unique, cow-print package! Serving our award-winning soft serve with chocolate dip, handmade sauces and toppings, local berries, ice cream sandwiches, speciality sundaes, and more, we have a full ice cream parlour experience on four wheels. Stop by for a treat and turn your day in to a special one. Using seasonal flavours and sourcing local ingredients and suppliers, we are proud to work with Em’s Kitchen, Mayringue’s, Mullion Cove, Essential Trading Co-Operative and more. Sometimes you just have to go that extra mile though – Attention to detail is so important to us that we have our sprinkles shipped from Sweetapolita in Canada! 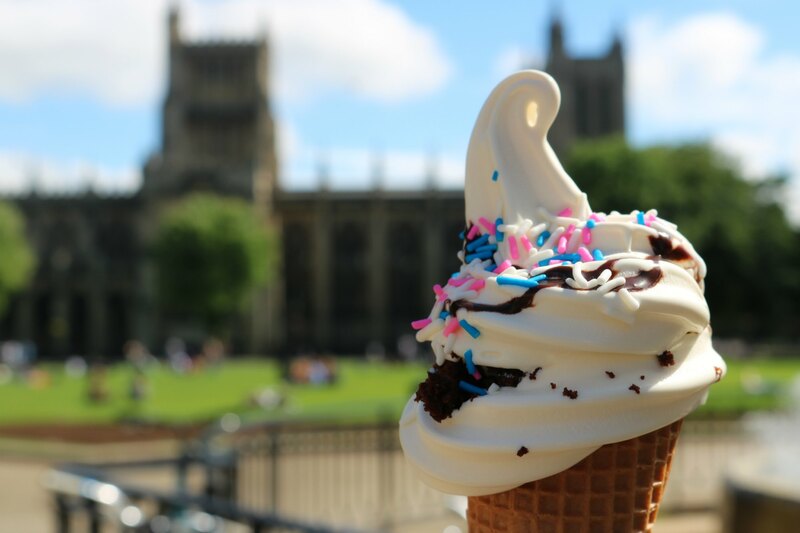 We are proud to serve ice cream to the good people of Bristol: College Green is our home pitch and we’re there from April till October – check out our Twitter and Facebook feeds for opening times. Let’s Make Your Day Special! Have a Vee Double Moo Wedding! Contact us for all you ice cream dreams – we can suggest a menu or can work with you to create something extra special and unique to your wedding. Options can include salted caramel apple crumble pots, chocolate dipped ice cream with smoked sea salt, regional variations such as lemon tops and oysters – or even alcoholic ice cream shots in bourbon caramel, tequila lime and kirsch sour cherry. Our vintage 1973 VW camper Daisy or shiny new Brazilian import VW camper Ruby will add a wow-factor to your wedding day or special event. Get in touch if you’d like some extra glamour & style at your celebration – guaranteed to be a memorable part of your special day. For enquiries please email weddings@veedoublemoo.co.uk or complete the enquiry form below. Add some sprinkles to your event! We love a good party at Vee Double Moo! Whether it’s promotions, a landmark birthday, a team thank you or any old reason to have a party, Vee Double Moo offer some fantastic packages that will thrill your guests and make it an occasion to remember. Whether it is a lunch time staff treat or full dessert option for client functions, we can bring our years of experience and fantastic, fun ice cream to your place of work or venue. For enquiries please email events@veedoublemoo.co.uk or complete the enquiry form below. Big Kids & especially Little Kids! Do you want something special and different for your child’s Big Day? Why not have our ice cream van arrive at your party playing ‘Happy Birthday’. A great photo opportunity, it’s unique, fun and the possibilities for toppings are endless. For enquiries please email kids@veedoublemoo.co.uk or complete the enquiry form below. NEWS: BACK WHERE MOO BELONGS! New for Spring 2019! We will be BACK on Brandon Hill, at the foot of Bristol landmark Cabot Tower. Follow @VeeDoubleMoo for Brandon Hill opening times, specials and all things ice cream #waybeyondicecream"